Multiscale modeling using computer simulation is increasingly recognized as a major method, along with data-mining, for assimilating the vast and ever-growing knowledge base in systems biology. This will improve understanding of the links between molecules and disease manifestation for translational research to the clinic. 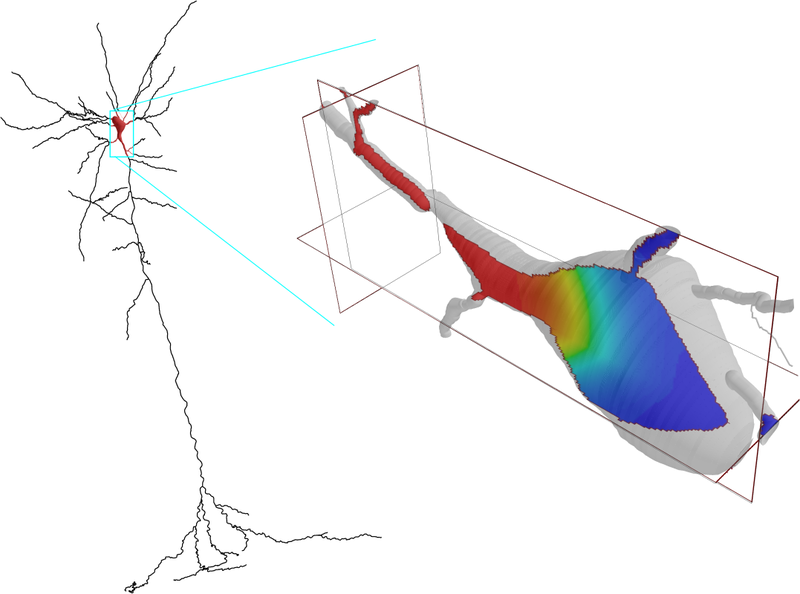 The bridging of chemophysiology (chemical signaling in neurons and astrocytes) with electrophysiology provides a fundamental connection that will necessarily underpin higher organizational scales. Multiscale models are particularly difficult to simulate in neurobiology due to the elongated nature of neural cells (compared to compact cells for many other cell types), and to multiple overlapping of embedded scales (eg pyramidal apical dendrite domains at the same temporal and spatial scale as local networks). We are developing the widely used NEURON simulator to accommodate simulation of these complex second-messenger signal interactions that contribute to information processing. In the prior funding period, we added the reaction-diffusion module to NEURON, providing 3D deterministic diffusion linked to reactions situated in cytosol, on or within internal organelles, or on plasma membrane. We also added 1D deterministic diffusion to reduce high computational loads that limited the scope of simulations, noting that the detail of full 3D diffusion is not always needed. As part of these improvements, we extended NEURON's Python interface to include a new set of classes devoted to reaction-diffusion modeling. Additionally, we prepared connectors for interfacing with SBML (Systems Biology Markup Language). In the current proposal, we will build on these advances in order to allow development of "mosaic" simulations involving combinations of stochastic and deterministic simulation in both 3D and 1D. This will involve the ability to readily switch among these different levels of approximation so that different modeling approaches can be compared. These objectives will be achieved through the following Specific Aims: Aim 1. Multiple multigrid methods: 1D and 3D grids with different sized grids at different locations. Aim 2. Parallelization using multisplit methods that allow the simulation of a single neuron to be run across multiple processors or across multiple threads on a single processor. Aim 3. Stochastic simulation using an extended Gillespie method. This will complement additional stochastic methods that will also be made available in NEURON. Aim 4. Dissemination: new Graphical User Interface for front-end specifications for viewing results, model development, model importation and merging, method comparison and multiprocessor deployment. Making the tool accessible to the community via courses, tutorials, example programs, documentation and online help.